Secretary of Education Betsy DeVos teamed up with Ivanka Trump on Tuesday at the Smithsonian’s National Museum of American History, where the the pair read to a group of girls in an effort to excite them about science, technology, engineering and math (STEM). The pair took turns reading "Rosie Revere Engineer" -- which Trump said is her 6-year-old daughter Arabella's favorite book -- to a group of 6-to-10-year-olds from the Boys and Girls Club and a local YMCA in the Washington, D.C., museum's SparkLab. The first daughter, who serves as an adviser to the president, tweeted a video of the event, describing the attendees as "amazing girls." According to a U.S. Department of Education press release, the reading was intended to "to encourage students to stay actively engaged in their education while on summer break ... This event is a continuation of the Department of Education’s summer reading initiative and will focus specifically on getting girls excited about science, technology, engineering and math." "Fun morning of #SummerReading with @IvankaTrump and many incredible young girls at the @amhistorymuseum #SparkLab," tweeted DeVos. Another DeVos tweet read, "Engineer? Scientist? Coder? These girls all have bright futures ahead of them! #SummerReading #GirlsInSTEM #SparkLab"
After the reading, Trump snapped selfies with the pint-sized leaders of tomorrow, which the White House documented on its Snapchat account. 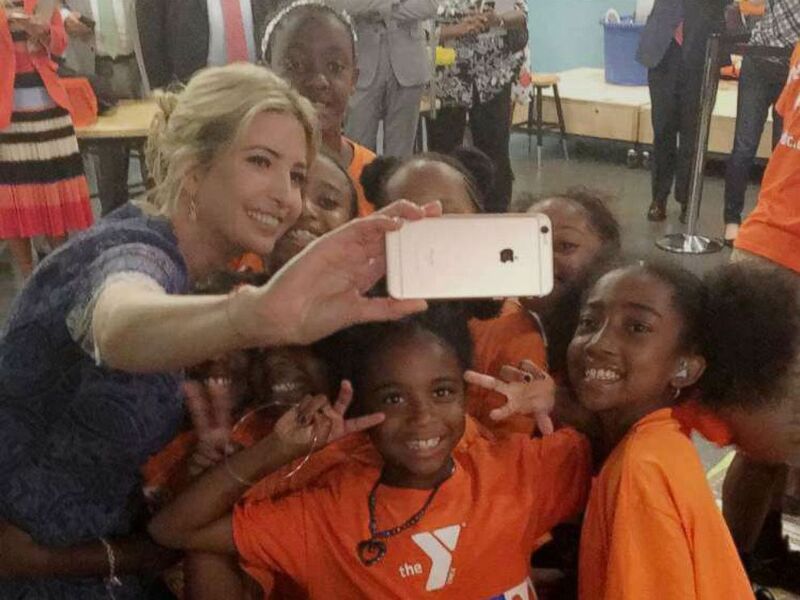 Ivanka Trump snaps selfies with girls at a reading event at the Smithsonian’s National Museum of American History in Washington, D.C., on July 25, 2017. And David Skorton, the Secretary of the Smithsonian, tweeted, "Proud to show our important #STEM & innovation programs @amhistorymuseum #SparkLab to @BetsyDeVosED & @IvankaTrump at #SummerReading event."